• Exchange activities with local air cadets and sea cadets in Halifax and Mount Uniacke. The overarching purpose of this trip was to offer these young cadets an opportunity to learn about another region of Canada, make lasting friendships, promote a healthy lifestyle, and develop an understanding about the unique history and rich traditions that have enabled Canada to become one of the best and most-respected countries in the world. Enjoy the article! On a beautiful Sunday, after a relaxing but long travel day on the bus, the cadets were given the chance to blow off some steam by going to the gym in Gagetown, also known as the Argonaut Cadet Training Centre. A range of sports and physical activities were offered, such as volleyball, soccer, etc., which the cadets enjoyed immensely. The atmosphere was charged with excitement, there was music, and everyone got to loosen up and appreciate the first day of activity of the trip. After a few hours of physical activity, the squadron went to an arcade. There, the cadets were free to go bowling, go to the laser-tag, and play the numerous arcade games. The arcade was really fun and entertaining, and permitted the squadron to bond and make lifelong friends. Sunday was a great day which the cadets loved, planned by our wonderful officers and seniors who dedicated their time and energy to organise this whole trip. On the way to Greenwood, we stopped in Sackville N.B. and had a pizza party at the local legion. Monday came with an unexpected surprise as the cadets of 1 West Montreal woke up in Greenwood to find a downpour of snow. It quickly became apparent that the day’s planned tours of the base’s aircraft squadrons would unfortunately be cancelled. The cadets, however, had nothing to fear as Major Leslie and our local liaison officer, Lt(N) Enslow quickly arranged alternative activities. After breakfast, the cadets were given time to ensure their uniforms were in excellent condition for the week’s citizenship tours, before being split up into groups to visit some of the base’s facilities that were still open despite the severe weather. Through the storm, the cadets trekked the 500 or so meters to the base firehall, where friendly firefighters were happy to show off their equipment including a half dozen massive fire trucks. Some cadets were even lucky enough to operate the legendary jaws of life, which went through tin cans like a hot knife through butter. From the firehall the cadets visited the Military Police Shack, where they were welcomed by MPs who explained the many functions of the military police force. As the snow subsided in the late afternoon, the cadets were given some time to relax, play board games and even do some karaoke! The day was capped off with an exciting movie in the base cinema. Overall, with this fun and interesting day, the cadets of 1 West learned a valuable lesson: even when things don’t go as planned, you can still enjoy yourself immensely as long as you have the right attitude. On Tuesday (March 4th) we had the chance to participate in three activities. Early in the morning, we visited the Greenwood military base aviation museum. 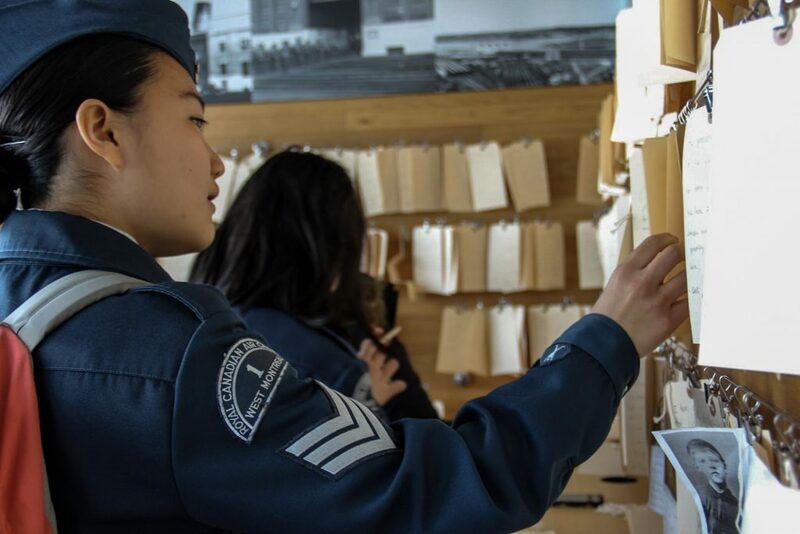 This activity introduced cadets to aviation history and permitted them to having a better idea of the different aviation aspects that might be addressed in many activities at the squadron or during summer camps. The second one was the ski day at Ski Martock. The fact that all cadets had to go through a ski level check-up before attacking the descents was great, since it led to no one being injured (unlike last year’s ski experience where we ended-up with several minor injuries). This was a good improvement, and shows how seriously the squadron staff focuses on our safety and security. 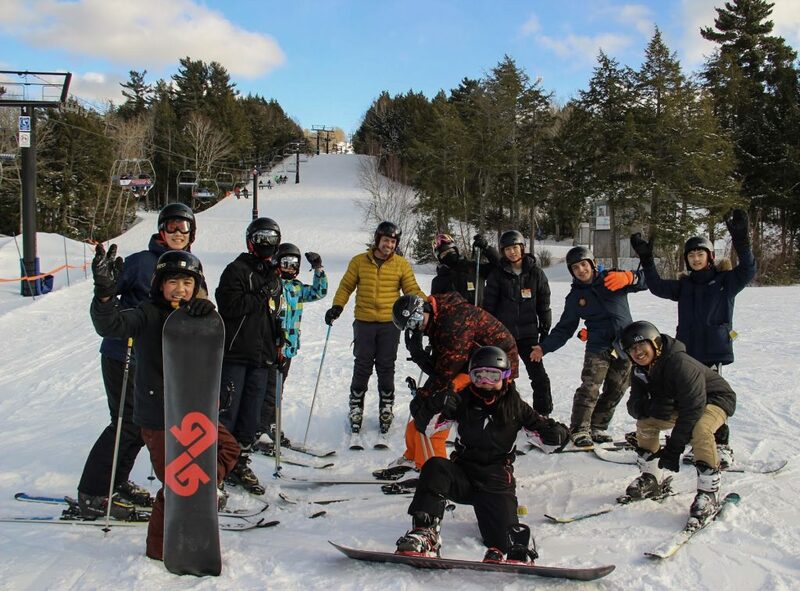 As for the ski itself cadets really enjoyed the activity and the perfect skiing weather and fresh snow, and at the end of the day, they were happy to have spent such a nice day together and getting a lot of physical exercise. It also helped cadets know each other better and us seniors to know more about our cadets. The only issue of the day was the carelessness of some cadets who left their box lunches on the tables after eating, which made other people discontent. However, everything ended-up being cleaned by seniors and several cadets who helped. In the evening, we traveled and got the chance to spend dinner at 356 Wolf Royal Canadian Sea Cadet Corps in Mount Uniacke, NS, where our third activity took place. We ate pizza and had the chance to dance with the sea cadets after our meal. The ambiance was good, new recruits even had the chance to experience and learn some of the famous cadet summer camp dances. In the evening we traveled and arrived at Shearwater base. Wednesday started off from our wakeup call on the first morning at CFB Shearwater. After breakfast, the cadets suited up in full uniform to take on a full day of tours in the heart of the city of Halifax. 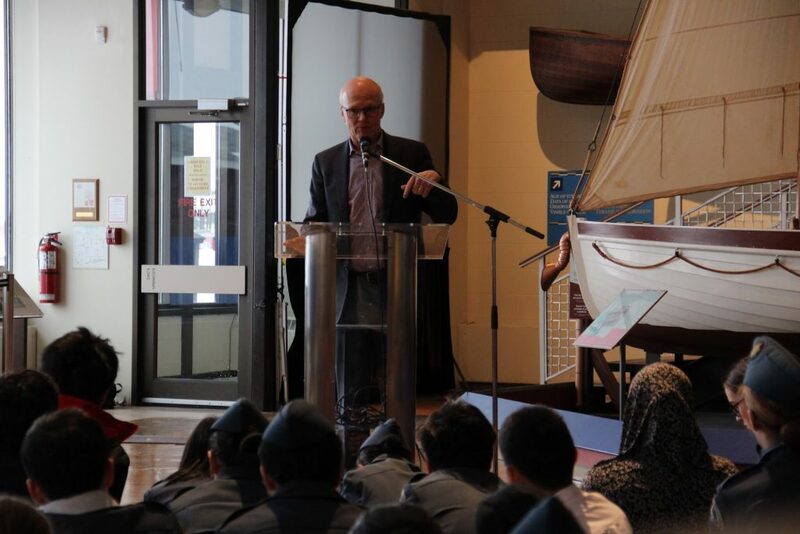 Our first stop was the Pier 21 Immigration Museum. We were directed from our tour guides around the museum, viewing the historical events that occurred in Halifax. The museum once used to be a docking facility that welcomed immigrants around the globe into Canada. In present times, the pier is reconstructed and refurbished into a museum and offers tourists a flash to the past on how Canada became the multicultural country we have all now come to know and love. Our next stop was the Maritime Museum of the Atlantic. The building depicts Nova Scotia’s rich maritime heritage as it brings out old artifacts from the ships that sailed into the country. Other well known artifacts such as pieces of wreckage of the infamous Titanic can also be seen in the museum. Over an hour into our visit, the House of Commons speaker, The Honourable Geoff Regan came to pay us a visit and give an inspirational speech to the air cadets. After the visit, we then walked towards the Citadel of Halifax. The cadets were shown the lives of the militia in the 18th century. A couple of guards led us to the multiple sections of the refurbished barracks and offered to show us a breathtaking view of the city of Halifax from the top of the base. To conclude the trip we went to the Neptune Theatre to watch a contemporary play called “ Noises Off “. It was a stunning act comedically portraying the lives of actors behind the scenes. The cadets laughed and enjoyed the play and left the Theatre with smiles on their faces. 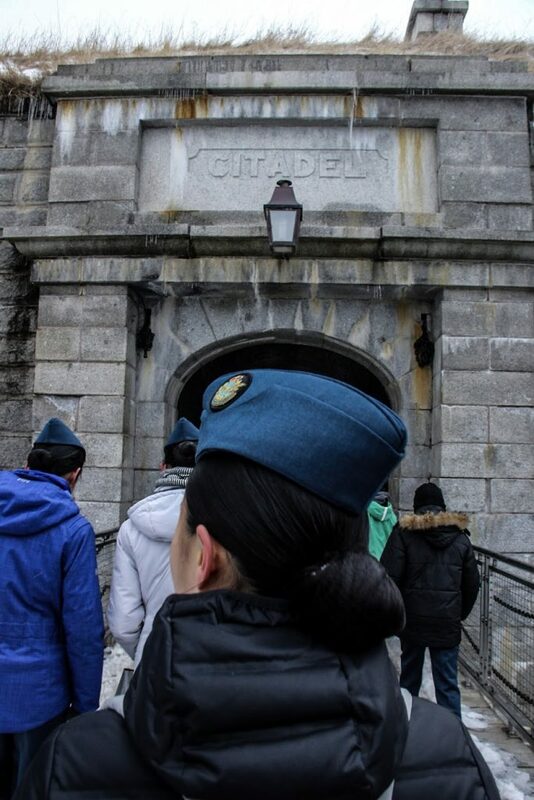 All in all, this part of the trip was to familiarize the cadets of 1 West Montreal Squadron the citizenship aspect of the Air Cadet program. Thursday began as all other days did, with a wakeup call and a march to breakfast. Afterwards we embarked on the busses and made our way to the Navy Readiness Center. Here, cadets saw firsthand how the Canadian Navy keep all of their sailors and naval officers duty-ready, while not at sea. The Center provides crew members with valuable emergency training and prepares them to deal with threats on the boat. The cadets saw how sailors deal with holes and leaks in their ships, how to put out fires and went over the equipment available to first responders on a ship. Afterwards we went to the port of Halifax and we visited one of Canada’s submarines under repair, HMCS Windsor, a Victoria-Class. The cadets were given tours of the vessel on the outside by both crew members of the submarine and of technicians and repairmen who are trained to know the sub inside and out. Once the tours were done, we went to one of Canada’s Submarine Training station and we were given tours of the simulation rooms were crew members are trained to operate and maintain the submarines under multiple scenarios. In the evening, we had the opportunity to go swimming at the Canada Games Centre: Halifax Recreation & Sport Facility, and meet some local cadets from 865 Kiwanis squadron, Major Leslie’s former cadet unit where he retired as WO1 in 2000. All the cadets certainly enjoyed the opportunity to make new friends from Halifax, all the while enjoying swimming in the huge pool. It was also a great chance to meet create some familiar faces before we would all meet again at the regional dance the following day. On Friday, we had the opportunity to have one last tour of Shearwater base and many other military facilities, which the cadets thoroughly enjoyed, as well as a dance hosted by the cadets from the region. The tour was very informative as well as entertaining. The base tours included the CH148 Cyclone helicopter static display, the ATC Tower/Wildlife Control Officer (WCO) demo, and the Shearwater Aviation Museum. 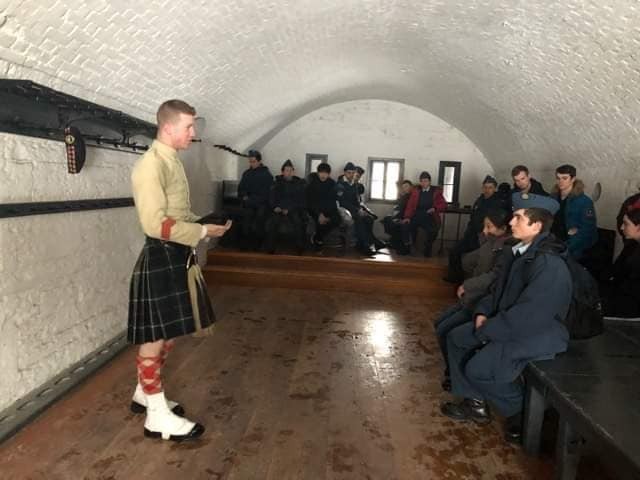 The tour made cadets learn about meteorology, aviation, and the Canadian forces in a very interactive and effective manner. We were kindly hosted with cadets from other local units at the 865 Kiwanis Squadron dance that evening. They did their best to show us the way and make us feel at ease. By the end of the night, our Squadron’s cadets had gotten to know the local cadets, and some had even bonded and exchanged contacts. Overall, Friday was an extremely rewarding day. It was clear to see that the cadets thought so as well. In general, the cadets genuinely appreciated the activities and events planned for the day. On Saturday morning we spent a few hours at the Mic Mac Mall in Dartmouth shopping for souvenirs before having lunch in Shearwater and leaving for Gagetown in the early afternoon. We arrived in Gagetown just in time for supper and a quiet night at the Argonaut Cadet Training Centre. The bus drivers were concerned about winter road conditions in Quebec, so we left as early as possible on Sunday morning, and drove home to Montréal, arriving on time, and on target early Sunday evening.